Ever since the successful release of Forzani and Cattet's modern take on the giallo, Amer (2009), there's been a glut of giallo inspired films, igniting a new interest in the genre. 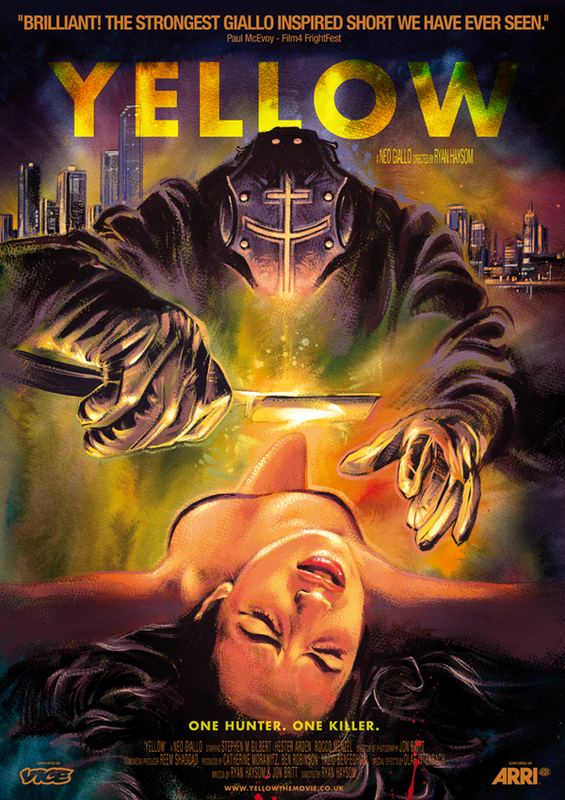 However, no film seems to have captured the essence of the giallo and updated it for the modern age with as much success as Ryan Haysom and Jon Britt have managed in their 2012 short "Yellow" dubbed by the pair as a Neo-Giallo. Whereas films such as The Strange Colour of Your Body's Tears and Symphony in Blood Red seem to have missed the mark on what makes a great giallo, Haysom and Britt clearly understand the genre and thrive in bringing it to life in Yellow with an effective contemporary slant. Despite running at only 26 minutes, Haysom manages to create an incredibly tense atmosphere, filled with stunning visuals and impressive special effects, all the while maintaining an interesting, mysterious story and a satisfactory, if not suitably vague, ending in keeping with the genre. 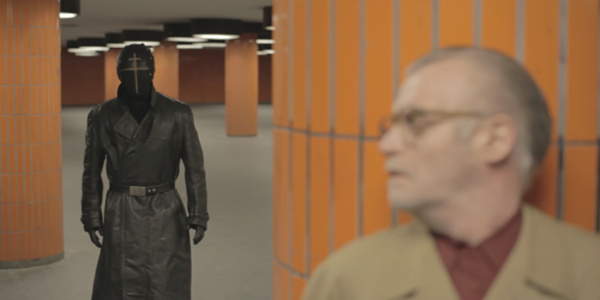 The film follows a nameless, weary old man who drives around neon lit Berlin seemingly haunted by his own thoughts and memories. The man arrives home to a sinister phone call from a mysterious caller and so begins his hunt to track down the man on the other end - a serial killer who is terrorising Berlin. Stephen M. Gilbert is great as the man and conveys a real sense of a person who has been worn down, struggling with his very existence. Hester Arden is an effective giallo female and her presence in the film was an interesting aspect due to her portrayal of all female characters in the film. Perhaps this is a sly nod to the faceless, interchangeable female victims in giallo and horror films in general. 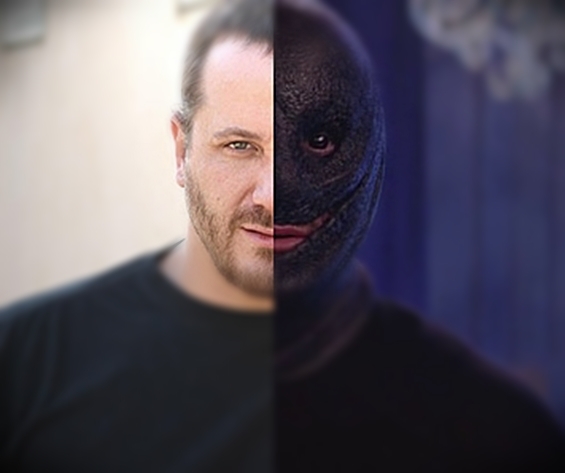 The gloved killer, Rocco Menzel, is a foreboding character who dons a leather cut out mask rather than a wide brimmed hat giving the giallo villain a modern update. Yellow looks absolutely phenomenal, filled with interesting shots and beautiful lighting true to the giallo genre. It slightly reminded me of the Maniac remake starring Elijah Wood in terms of look and lighting. I was blown away by the look of neon lit Berlin which truly is the standout element of the film. The most unforgettable moment of Yellow was the cat and mouse scene in the Berlin underground which utilised its retro, orange and concrete surroundings perfectly, creating a stunning backdrop to a very tense scene. Every shot in Yellow looks stunning and it's clear that an incredible amount of thought and detail has gone into creating each frame of this short. There's a fluidity and artistry to the short which demonstrates the beauty and art that can be created in a horror film. It's also worth mentioning Yellow's fantastic synth tinged soundtrack courtesy of Antoni Maiovvi. The music throughout the film really heightens the tension and overall atmosphere of the film feeling eighties inspired whilst bringing something fresh and contemporary to the short. I can't recommend Yellow enough. If you're interested in a copy, there's contact details available here for producer, Catherine Morawitz, who will be more than happy to fix you up with a copy. The DVD costs £8 but for £28 you can get hold of a special package limited to 66 which includes the film on DVD as well as a fantastic VHS copy that looks like its straight from the era of the video nasty. You also get some postcards and a poster of the incredible artwork by Graham Humphrys (El Topo, Evil Dead) all contained within a lurid yellow box. I'm delighted that Yellow got made and in an era of neo giallo duds this one shines bright like neon lit Berlin. Note: Yellow is also available with the new Blood and Black Lace release from Arrow. Rachael Nisbet is a Criminology expert and a Gialli fiend from Edinburgh, UK. For more of her lovely writing features and razor sharp wit, please follow her on Twitter HERE. This amazing article was originally posted HERE. CIAO!